If you’re planning a trip to Hawaii, you’ll want to consider the Island of Hawaii (aka the Big Island). It’s the largest island, and it’s also the closest island to the mainland. You can easily take a direct flight from San Francisco or LA to Kona. One thing we loved about the climate on the Kona side of the island is that many restaurants, and even the airport, are open air. The west side of the island is very dry, and the east side of the island is full of rainforests and waterfalls. The Big Island is also the world’s most active volcano! The island has all of the world’s major climate zones, so there’s a variety of things to do. Sit on the beach or snowboard on the top of a Mauna Kea. We recommend renting a car on the island if you plan to explore, as ride sharing apps have recently been added to the island, but aren’t fully accessible yet. The Island of Hawaii has a huge variety of things to do. You can do everything from relaxing by the pool to trekking through the jungle. Below are just a few options. We recommend planning your vacation so that you don’t spend a lot of time in the car. That’s why we highly recommend a helicopter tour, especially if you’re there for a short time. Helicopter Tour – If you have this as an option, you must do it. There are two main helicopter companies on the island, Blue Hawaiian and Paradise Helicopters. Most of these services will pick you up at your hotel. You won’t be able to take much with you on the flight, just a camera and phone. Make sure to wear dark clothing so you won’t reflect in the windows and ruin your view. A helicopter tour allows you to see as much in two hours as you could see in two days by car. Luau – You can find one every night of the week on the island, but this is one that we’d recommend skipping. From what we witnessed, they tend to be overpriced and not the experience you think you’re looking for. If we were going to attend one, we’d try the luau at Four Seasons, but this is only one night a week and is only open to hotel guests. Explore Waterfalls – You can go on numerous hikes on the Hilo side of the island or choose to see them from the air. 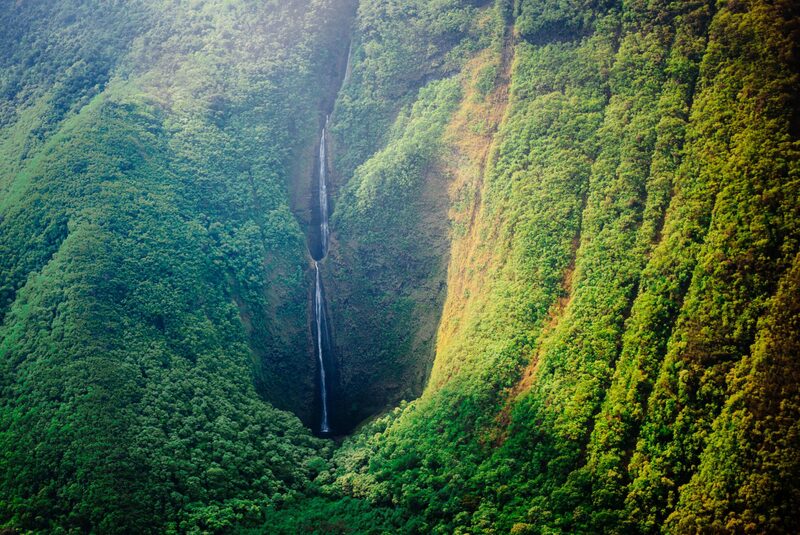 Certain helicopter tours will even land at a waterfall. Explore Volcanoes – You can choose from a variety of options to do this. Choose from driving, hiking, bike tours, or helicopter tours. Depending on the lava flow, you may be able to see lava flowing into the ocean from a boat tour. Tour guides typically know what is currently going on around the volcano and can help guide you for the best shots. Punaluu Beach – For a change of pace, visit black sand beach. Turtle Watch – Keep an eye out along the coast for turtles. They lay on the rocks and sand in the afternoon to take a nap. Make sure you stay 15 feet away. It’s also fun to watch them feeding in the surf. Manta Ray Swim – Schedule a swim at night with manta rays. Snorkel – There are many opportunities around the island to enjoy snorkeling. Some resorts even have tours and provide equipment for snorkeling. Coffee Tours – There are many coffee farms in the mountains near Kona. You’ll need a car to drive to them, but they’re typically only about an hour outside of the city. You can also stop in to Kona Mountain Coffee if you want to pick up coffee and other local treats to bring home. When you order coffee, look for 100% Kona Coffee. Most coffees are blends, and it only needs to be about 10% to be called Kona Coffee. Da Poke Shack – A casual spot to find a variety of poke bowls. Beach Tree Club – Sit on the beach and enjoy cocktails or a Meditterianan style food. You’ll find anything from sushi, pizza, or hanger steak. Make sure you try the frozen lemon pie! Kona Brewing Company – Go here for some of the best beer and pizza on the island. If you want to bring beer back with you, make sure to bring along a shipping container. We wanted to bring beer back with us, but they don’t have any shipping containers on site. 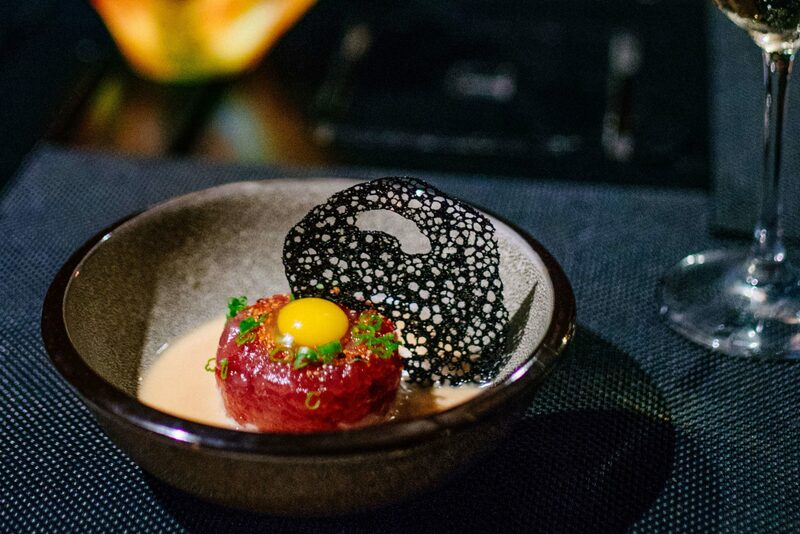 ‘ULU Ocean Grill + Sushi – For a date night out, you’ll want to head here. This was some of the best food we’ve had on the island. Napua at Mauna Lani Beach Club – We recommend trying the BBQ guava ribs. 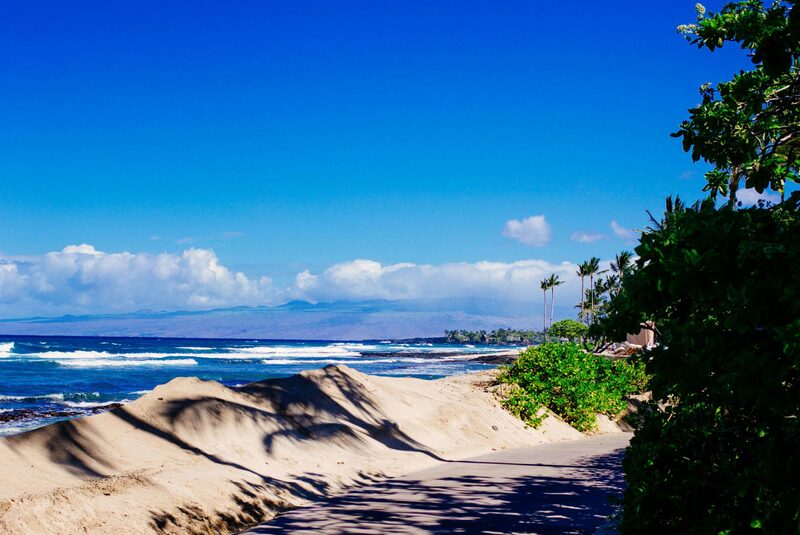 We recommend staying on the west side of the island near Kona. There are several resorts right on the beach. We’d recommend Four Seasons Resort Hualalai for a high-end experience with exceptional service, or the Fairmont Orchid, which is farther from town. Both have fantastic locations right on the coast. Thank you to Alaska Airlines for sponsoring this guide.